Surprise Endings… or Guaranteed Happy Ones? 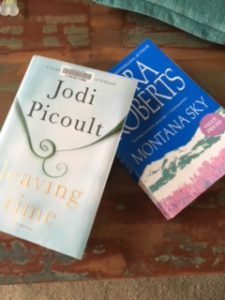 This week, I’ve been reading two books: Jodi Picoult’s LEAVING TIME and Nora Roberts’ MONTANA SKY. Both are for a class I’m teaching, and both are excellent books. But reading them in tandem confirmed to me why I prefer romance. LEAVING TIME is gripping, a page turner. 9/10 of the way through, I didn’t know how it would turn out, even going so far as whether one of the main characters would survive. Although it’s a great story and beautifully written, I actually had to stop reading at several points and settle myself by reading some solid romance. MONTANA SKY has some dark moments and chapters. Betrayal, domestic abuse, and even murder are integral to the plot. Yet while the book has disturbing elements, I’m not disturbed… because I know everything will turn out all right in the end. Justice will be served. Love will win. It’s not that I have had a trouble-free life, nor that I think all endings are really happy. While I’ve been blessed in many ways, I’ve had my share of disappointments and dashed hopes… just like most people. Thing is, I don’t want my entertainment to be like life. I want it to be better. I want the books I read, and the movies I watch, to be uplifting and hopeful. I want to feel better when I come out of the movie theatre or close the book, not worse. I want the day’s frustrations and troubles to be obliterated by my choice of reading, not echoed in it. And that’s the type of book I want to write, too: books that readers can trust as an escape from whatever reality they’re facing. I want to write books that can help a frazzled young mother find a few minutes of peace. Books that can offer a caregiver—who knows that her loved one, struggling through radiation and chemo, is probably going to lose the battle—a few moments of hope and happiness. Books that can help a gawky, acne-faced teenage girl believe that there’s a boy out there who won’t tease her, but will instead see the beauty within. Believe me, I love Shakespeare’s tragedies, and I celebrate much literary fiction for its artistry and philosophical insight. But for my own pleasure and recreation—for my own calling as a writer—I’m sticking with books that guarantee readers a happy ending. What about you? I know you enjoy lighter reading and happy endings, or you wouldn’t be visiting InspyRomance. But do you also enjoy deeper, darker, and more ambiguous literature? What’s the right balance for you? 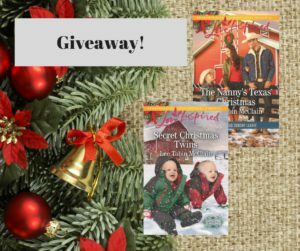 Comment to be entered in an early Christmas giveaway for two books that DEFINITELY have happy endings! HI Lee. I’m a mood reader- I choose books depending on my mood! 95% of the time that is romance, but I do thoroughly enjoy a good romantic suspense, mystery as well. I read because I want to escape and have a moments peace- you said that so well Lee! but I also like to think and reflect on my own relationships. HEA is the best though…otherwise I feel ripped off! Makes sense… I like mysteries myself, but only cozy ones. Thrillers are too scary for me! I’m one who doesn’t mind what they go through to get there, but the ending HAS to be happy. It’s definitely why I lean romance, although I’ve found other genre authors who manage the HEA every book (even if that’s not necessarily a romantic one.) But, if it’s a new author and hit those points where I’m not sure it’s going to work out? I’m with you and will take a break to read something I know is going to be satisfying. So true. I read some books labelled “women’s fiction” (in fact, Jodi Picoult’s books fit that category). But some authors of it, like Kristin Higgins, write women’s fiction with that guaranteed HEA. That, I like best. Hi Lee. I love the thrill of reading the books that take me into the wonder who did it feeling with all the action and suspense that goes with it. I also love the romance books that relax me and leaves me with the sweet calmness that I often need. Judith, sounds like you’re another mood reader, like Wemble, above. I also much prefer knowing the book I’m reading will end with a HEA. I used to read almost all mysteries and truly enjoyed them. But as I’ve gotten older, I don’t want to read the dark stuff. Also, I think the times we’re living in has affected that. I want my books to be uplifting and leave me feeling hopeful. I’m the same way–I appreciate lighter and happier books more and more as I get older. I haven’t thought about it, but I guess that I really do like to have the HEA at the end of the book. I really like all genres, but I can’t read a heavy book at night or I won’t be able to settle down and go to sleep. I can’t read teaching books or books that make me think at night either. That’s partly why I read so many books at the same time – one or two during the day and usually in print. Then my kindle at night when I’m in bed. And in certain moods, I reread one of my favorites. And… another “mood” reader! I am with you that the HEA is especially important at night. Sometimes I reread Jane Austin at night, or listen to her books on audio. I know them so well I can practically recite them! Best line of the day, “Thing is, I don’t want my entertainment to be like life, I want it to be better”. You have expressed my feelings on reading exactly and to the point. This is also why I only read Christian fiction, most other books just leave me feeling empty. I do want stories that reflect real life circumstances, but I always want to feel the inspirational element of hope and faith. Thanks for the comment, Tracey. That’s why I love writing Christian fiction. I know if it’s Christian Fiction, it is Noble Bright in plot and outlook. Grim dark I can get from the news. I like my books and movies to have happy endings. I agree with your statement that you don’t want your entertainment to be like life. I like to finish a book with a happy sigh. Oh, yes, that happy sigh! Love that feeling! No matter the genre, I love happy endings. I read Christian fiction almost exclusively because, like you, I want whatever I read to be uplifting. Yep. Books are one place we have control over our input and our state of mind. Thank you! 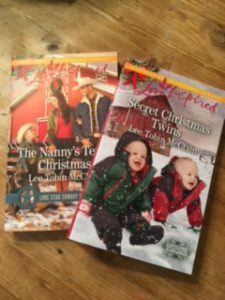 If you win, remind me that you’ve already read Secret Christmas Twins and I’ll send you another book in its place. Hi Lee! While I enjoy reading a variety of genre: romance, historical fiction, and cozy mysteries. What I read depends on life and my mood. Most of the time I do not mind I enjoy reading HEA; but after about two months of binge romance reading, I had enough. Often the stories are too predictable – when I can predict the outcome in the first couple chapters. Time is precious and I will not finish the book. Life is tough. In the last six weeks all three sons had to replace a car, we have had sick parents and children, one of the wettest falls in history with gloomy skies. Therefore, I had enough of HEA. I needed a good cozy mystery. Thankfully my favorite cozy mystery writer Hope Callaghan came to the rescue. Also thankful for Tales You Can Taste: A Book Club for Foodies monthly selections – no romance stories with HEA. Great discussion question Lee. Enjoy reading the many responses. I agree that you can get too much of a good thing. I also like to turn to cozy mysteries as a change of pace. Hope things start looking up soon for your family. I love happy endings! I read to escape and relax. I don’t need to read all romance, but I do need a book that resolves in a hopeful way. The world has enough gloom and despair, and as Christians, we know the end of the story! Some of the comments above reminded me of when I first discovered Ellis Peters’ Brother Cadfael mysteries. I thought I’d try her other, modern day mysteries. Well, the modern day ones were awful! Too much gore and no hope. The Brother Cadfael ones, by contrast, were always redemptive. People did die in them, but there was resolution and often hope for the one who did the murder. That brings back a very fond memory, Margaret. Love the Brother Cadfael books! Maybe I will find one to read over the holidays–that would be a treat. While I definitely enjoy “lighter reading and happy endings” and “don’t want my entertainment to be like life,” I do —sometimes— enjoy deeper literature that I have to “stop reading at several points”, not because I wonder if the characters will survive, but because I want to let the words sink in. Like yourself “I want the books I read, and the movies I watch, to be uplifting and hopeful.” That does not exclude deeper reading in my opinion. Most of the time I like to know there’s an HEA and know where I’m heading—even with conflicts here and there—but not always. Sometimes I just want to be inspired and those books are in my life-changing, amazing-books-that-need-to-be-reread-and-shared pile (they are better if there’s also an HEA in the end). And, yes , I do have an actual “pile” (or a “collection” on Kindle for my online books) to separate those books from my everyday books. I’d love to know a couple of titles in your “Amazing Books” collection! I like to switch it up. Sometime s I like a book that keeps me on the edge and sometimes something that is sweet and tender. Throw in a book that makes me laugh also. There is always room for a change . Have a great day. So true I love a romance that makes me laugh. Jan Elder’s moose romance. Valerie Comer goat romance. Marin Ueckerman’s A Time to Laugh. Laughter is the best medicine. I love reading books with happy endings! Now that doesn’t mean that I don’t enjoy turmoil to get to that point, because I do! I just don’t want to end a book feeling like it should have turned out a different way. Most of my best reading time is late in the evening. I hate it when the ending of the book leaves me feeling haunted for a while. I like to finish a book with at least a little bit of a smile in my heart. Easier to get a good night’s sleep that way. That’s why I pefer cozies too. I love to read Christian fiction with HEA! I am reading lots of Christmas books now and would love to read yours! THANKS for the giveaway. I’m with you I feel the same way there’s so much drama and chaos in this world that I love to be able to escape into a good book and find joy particularly in a Christian setting that will inspire me and build up my faith. Thank you for all the comments… I think a lot of you recent commenters feel the same way: you (well, we) want the uplift, the laughter, the contentment at the end of the book–especially if we’re reading late in the evening. As a writer, I do love to plunge my characters into terrible trouble… I am known for angst more than for comedy… but you can be assured that things will turn out well. With God all things are possible, and my characters rely on that! I don’t like reading or watching things that get too dark or scary, which doesn’t take a whole lot for me, so most of what I read is on the lighter and happier side and the characters end up with a happily ever after. But I do occasionally read legal or military dramas, which I enjoy for a change. Jessica… it doesn’t take much for a book or movie to be too dark for me, either. Especially a movie. A friend is after me to see classics like THE GODFATHER. Nope. I know it’s brilliant, but I don’t want the scariness in my head. I like a wide variety of preferably Christian or clean fiction. I do have to agree with the fist post that I am a mood reader also. I like to switch between genres when I read and I also like to switch between light, happily-ever-after and darker, more ambiguous and thought-provoking books. I love both! I like to read both kind of books, the happy endings and the deeper ones. I must say, though that right now I am in a moment I prefer to escape the reality of life… so the happy ending books are winning.. I like my books and movies to have happy endings. Thanks for the giveaway opportunity! It’s all about the HEA for me! :-) I read anything from historical to suspense (Christian only) and I love romance in them, God’s way of course! Thank you for the giveaway chance Lee and talk about what kind of books we like!